Mercy's Halima celebrates a birth and the unity that, eventually, comes through the power of love, and pain of tragedy, to two families from opposing cultures. When the book was first announced in 2008, clashes between Muslim and Christians, triggered by a disputed local government election, killed hundreds in Jos, Nigeria, and made thousands of people homeless. Press reports say there have been more than 20 cases of ethno-religious violence in recent history resulting in more than 10,000 deaths and destruction of properties worth billions of naira. We asked Mercy some hard questions: How does Nigeria stop ethno-religious conflict? Is the violence fueled by religion or by poverty and frustration? 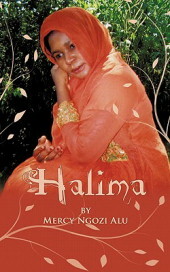 Mercy Alu: Halima was published in October of 2010, so it is fairly new. It does, however, highlight eastern and northern cultures of Nigeria, as is mirrored in other African countries with similar cultural patterns, such as what we see in Ghana. It was not written to focus on religion particularly, but subtle hints are there. I have noticed that ethno-religous conflict is based upon fear and ignorance. One of the things the book does is emphasize cultural values and norms that make us all similar, regardless of ethnicity or culture based on religion. It is a way of narrowing the perceived gap between cultures and begin to create the possibilities of living together and working towards common goals. Education and schooling have not really been embraced in some parts of Nigeria, and this is another key factor in the violence and ethnic clashes. Just as the main characters in the book, Halima, were united in cultivating their minds in school and overcame cultural differences, I believe education can empower all groups of people. Learning more about other cultures and ways of doing things helps to break down mentally constructed barriers, and puts the face of humanity on people who we would otherwise judge from a distance. Vitabubooks: What has the response been to Halima since its release? Mercy Alu: The response has been great. I have traveled to Nigeria several times since its release and students and educators, who have had a chance to read it, are excited. Some nonprofit organizations such as Hallomai International, founded by Dr. Blessed Madugba, have seen the book as an avenue to support African education and development. Dr. Madugba recently came back from Rwanda, and he had a lot of great ideas on how to utilize funds from book sales and making it available as a work of literature—much like books from African writers such as Chinua Achebe, Mariama Ba etc. I have also received responses about the book being written from an African woman's perspective, since there aren't too many writers in this genre. So far, the University of Nigeria, Lagos and Ebonyi State University are using the book in coursework. Halima has also been adopted in the United States by Eastern Illinois University and Indiana University of Pennsylvania for use in African studies and literature courses. Also, the associate chair of the humanities department at Harper College, Palatine, Illinois, reviewed the book to ascertain its potential contribution. My goal is to get a Kirkus review done for Halima soon. I welcome reviews and any input on continuing to promote this work. Mercy Alu: I am working on a compilation of short stories and poems. The short stories span Africa all the way from the west to southern Africa. Although they are original stories by myself, they highlight the African experience in their localities. Each story has its own setting, ranging from Sierra Leone to Liberia, and South Africa to Zambia . In addition, a new book, The Spirit of Change, 'Yes We Can', explores what the three words, which ushered in the first black president of the United States, really signify. It explores the power these words have in realizing our dreams as individuals, irrespective of where we come from, and globally, as the World. In the Year 2008, a historic moment dawned on the United States of America, and consequently, the rest of the world. The first black president of the United States was elected. It was a starry November 4th night, and the arena was packed full of citizens from all walks of life, old and young, educated and uneducated, rich and poor. Even little children cheered as the President elect Barack Obama took his stand on the raised podium. It was decorated with star spangled banners in splendid array. The tall, striking figure of the president elect in his well tailored dark blue suit, complemented the red, white and blue of the flag decorated podium, as he lifted his hands to the applause. After the first lady, Michelle Obama and the presidential children, Sasha and Malia were introduced, he began his historic speech which touched the hearts of many and re-ignited the dream of the United States of America. The highlight of the night came, when once more, the three words which skyrocketed the fabulous campaign of the new President elect to victory, and which summed up the essence of this new presidency, were chanted by the crowd in unison. These three words not only represented the hope of the American people, but people all over the world, “Yes We Can”!. **In 2010, Mercy Alu graduated from Keller Institute of Management with an MBA. She has taught undergraduate English at Argosy University, Schaumburg and she earned a bachelor's degree in English from Indiana University, Pennsylvania, in 1999. This is amazing! What a great article. What a gift this woman is. Thank you, Lebo. Mercy's really talented and we wish her the best for the future. Please follow the blog and stay tuned for more interviews with great African talent.